MexOut @Far East Square (Singapore) | Get Your Grub On! Yeah Baby, Another Taco Shop! When dining at ‘Intrepid’ yesterday we recognized this Mexican place next door and came back for it with more friends tonight. They have a built-your-own menu for ‘Burritos‘, ‘Tacos‘, ‘Rice and Salad Bowls‘ as well as ‘Nachos‘ but my radar was all on the ‘Tacos‘ tonight. I went with slab of ‘Tacos’ that come in three and mixed and matched a little to get a better idea of the flavors their menu has to offer. The first one was braised pork with cabbage and salsa fresca. It tasted nicely fruity and the meat was super juicy as they cook it in orange juice but the salsa fresca was not much more than just diced tomatos, onions and cucumbers. As second I had one with flank steak and the salsa verde. The meat was more chunky and didn’t have a very beefy or particularly special taste. I liked the salsa verde though as it was fresh and quite tangy in after taste. The last and by far my most favorite combination was the one with the beef brisket and mango pineapple salsa. The slow roasted brisket tasted fantastic and was very moist, the shredded cabbage added a nice crunchy texture to it and the fruity salsa was simply delicious, slightly acidy but so fresh and suited the dish just nicely and I also really liked the cilantro in it. I think this is a great place. 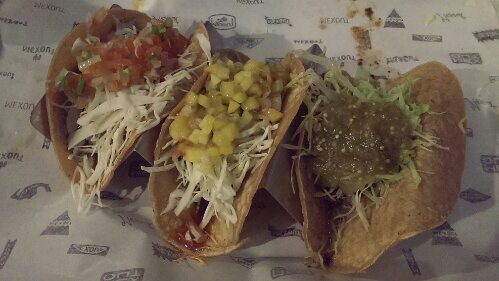 The food was pretty nice and very reasonable priced (3 tacos for 17$), they had good happy hour Corona buckets and the service was fast, on the spot and I found actually quite funny. Happy and content.